I'm so glad this bubble head announced. It's not just that Colbert's nightly Trump-bashing, which has propelled his CBS show to the top of the ratings heap, appeals to Democratic viewers looking for someone to topple the president. It's that Gillibrand was hoping to break through the static of a soon-to-be-crowded 2020 field in the midst of a government shutdown. 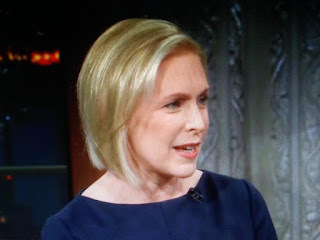 Even with the comedian's help, the New York senator's exploratory committee didn't make the front page of her home-state Times.